A great approach for getting results in lakes where the fish get a lot of pressure. Shallow, deep it really doesn't matter. It's a unique style that requires a special rod action to impart a quiver into a finesse worm on a jighead by subtly shaking the rod tip. It's kind of like drop-shotting right on the bottom. You don't want the bait to move across the bottom as much as you want it wiggle in place. Our rods feature a unique design that allows you to ”shake” the bait without a lot of wasted motion. NRX gives you incredible sensitivity and makes the rods so light you almost forget you had it in your hand all day long. Simply put, this is the best ShakyHead rod made... EVER! There's a unique action required with the ShakyHead technique. It's subtle, but it makes a difference. All of our ShakyHead rods are designed with a mid-tip flex so you can work the bait properly and still react quickly when the fish bites. This two-power ShakyHead rod is made for fishing in deeper water where you need slightly heavier line to keep fish out of the brush. It's deceptive in its power and, thanks to NRX, is so light and insanely sensitive you won't believe it. If you want the ultimate in a finesse fishing rod look no further. You're covered. Whether you're fishing tree tops in deep water or drop-offs with a lot of brush around, you want a rod with a little more backbone. This is a more powerful version of the NRX ShakyHead rods' just what you need when you go to slightly heavier line and baits for fishing deeper water. 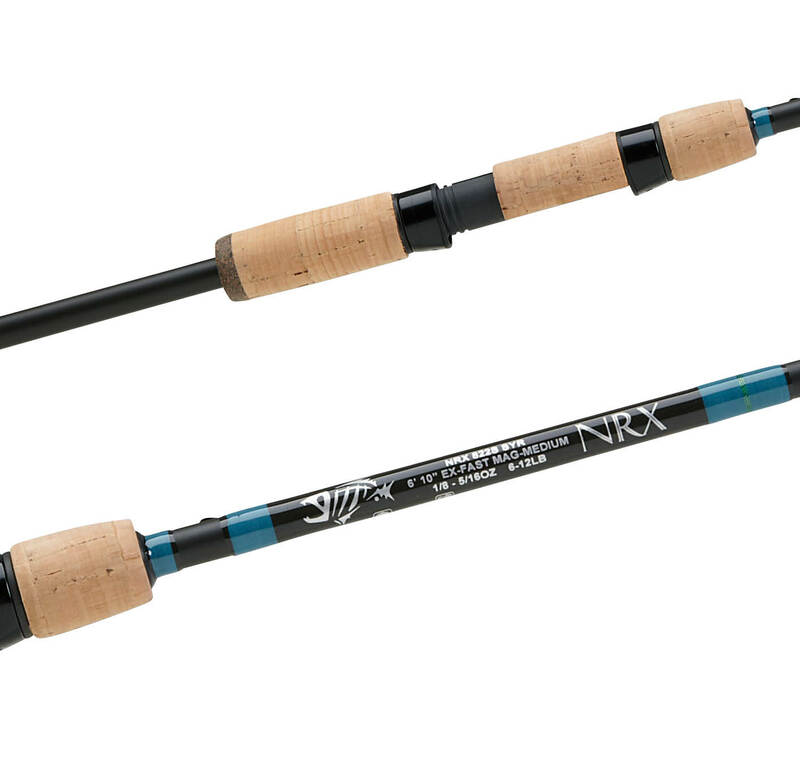 NRX makes this rod incredibly light and insanely more sensitive. It sneaky powerful and surprisingly responsive for positive hook-sets and fish-fighting control.